Unexpectedly KCTO Cleveland MO faded up on 1160 just after the dominating WYLL with a nice ID “KCXL Liberty 1140 AM The Oldies Station and KCTO Cleveland 1160…”. I found the ID when going through some Lemmenjoki files from 2011. The station has been heard a few times earlier during the last years here in Finland. 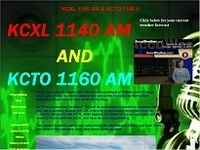 KCTO is the sister station to KCXL Liberty MO on 1140 located just nort of Kansas City MO. GM David Brewer confirmed my audio mp3 and told “…you did indeed hear KCTO. we still own it but a latino group rents it from us now”. 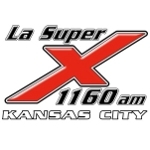 As of March 2012 KCTO has been carrying SS programming using the slogan “La Super X”. “And now more Legendary Songs and Legendary Singers, AM 14-50 WNBP” was the ID after the TOH news on 1450 in early March 2013 in Lemmenjoki.